This Klymit Static V2 Sleeping Pad Review is about the modified version of the enormously popular Static V pad. This modified version is again with the price without a match. Klymit Static V2 Sleeping Pad. It packs to ridiculously small volume. This pad comes with the best quality/price combination available on the market. You realize this when you see all its features and the $65 price tag. So regardless if you are a complete beginner or an experienced outdoor adventurer, this pad is a great choice. This new version (hence the number 2 in the name) is lighter than the previous pad, so this is now a surely great tool even for backpackers. It is great for hikers, kayakers, hunters, and for any outdoor activity in mild conditions. I stress this because of its low R-value, which is still 1.3. 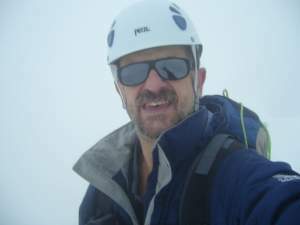 So do not plan to use it at high altitudes, this is not a tool for mountaineers. They have a different Insulated V pad for such a purpose. Observe its length which is still the same, 72 inches (183 cm), so it is not the best option for tall people. However, note again that the previous Static V is built also in a Luxe version so check it here if you need a bigger size. The main difference is in the fabric. The Static V2 version is with 30D polyester on the top and 75D polyester on the bottom, while the Static V is 75D everywhere. But this difference in the fabric thickness affects the weight (their sizes are still the same). So the Static V2 is 16.33 oz (463 g), while the Static V is 18.1 oz (514 g). It appears that the Static V2 is in only one color combination; the Static V has them 5. The price difference is negligible, around $5 or so. 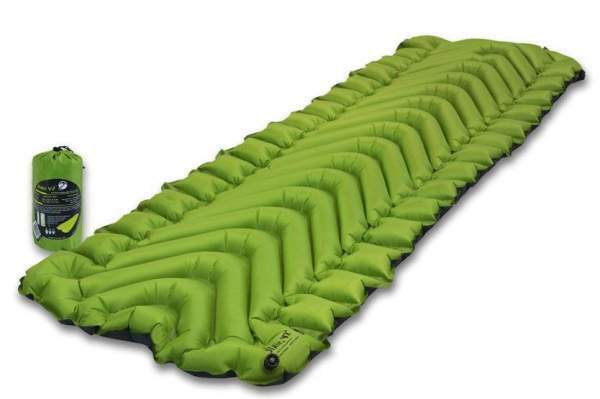 The Klymit Static V2 sleeping pad is an unsurpassed combination of weight, comfort, packed size, and price. When you inflate it, you see its unique V-shaped baffles and side horizontal baffles visible in the picture below, which combined help in keeping you cradled on the pad. These side baffles partly prevent air from shifting too quickly from chamber to chamber and this results in a uniform and consistent support at all points of contact. They also work well in combination with sleeping bags which have sleeves for pads on the bottom zone. Unique V-shaped baffles combined with side horizontal baffles. Observe the colors. On the bottom, you have a very durable 75D polyester material used in its construction, and the upper fabric is far lighter 30D polyester, so the weight is great, 16.33 oz (463 g), and the pad packs nicely to an incredibly small volume 8 x 3 inches (20.3 x 7.6 cm). All this is a puncture and abrasion resistant fabric with a minimal weight. They have achieved an ideal balance between the weight and durability of the pad. Inside the pad, you have the Anti-Microbial treatment applied to inhibit the growth of microorganisms, fungus, and bacteria. The valve is a single Twist-Pull system, reliable and effective. So you twist to open and pull and then start blowing the air. Inflation can be done in some 10 – 12 breaths. This pad uses the same technology applied in several Klymit’s pads, which they call Body Mapping Technology, see the picture below. This implies more support where your body needs it, while it is reduced where there is no need for it. The term Static is probably to describe the fact that it gives more support than ordinary pads, due to its unique baffling system, and also to make it different from their Inertia Pads. You can see some of those in the links on the bottom of this text. General impression by most of the users is the exceptional comfort this pad provides, in spite of only 2.5 inches (6.5 cm) of thickness. This again is due to the Static in its name and all technology applied there. So it works equally good for side and stomach sleepers, and for back sleepers. Body Mapping Technology presented graphically, for both the Static and Inertia Klymit pads. With 183 cm length (which, in fact, is quite typical for backpacking pads), this pad is short for many people. At the moment of writing this text, there are around 300 customer’s reports on Amazon, and the average rating is very high 4.4/5. The current price $62 – 65 can be one reason for such a popularity, but there is no doubt it is the quality as well, this is a great pad. See below how I rate it. Weight: 16.33 oz (463 g). Dimensions (L x W x D): 72 x 23 x 2.5 in (183 x 59 x 6.5 cm). Packed size: 8 x 3 in (20.3 x 7.62 cm). Inflation 10 – 15 breaths. *The comparison is for M or regular size. **This is an insulated pad. Obviously, the Static V2 Pad is the lightest of the compared models, its packed size is the best, and the price is beyond comparison. In the conclusion of this Klymit Static V2 Sleeping Pad Review, I wish to stress again the extraordinary combination of features and the price of this pad. It is less durable than the Static V version because the top layer is made of a thinner material, so it is important to bear this in mind, dependent on the purpose of the pad. If you are a long distance backpacker, you would certainly try to shed the weight and the Static V2 option would be better for you. But if the durability is more important, go for the Static V version. You will be doing great with any of them, these are great tools and I can recommend them both. 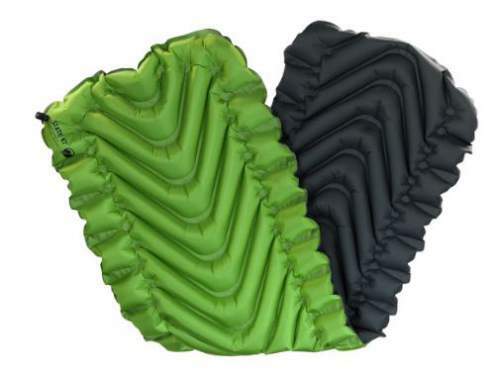 If you are a mountaineer like me and need the pad for higher altitudes, you will need an insulated pad, so check this insulated version from the same brand. Observe also several of their models in the links below. If you have any experience with this pad, please let us know, there is a comment box below. I wish you a pleasant day.